For the record, I am a HUGE peanut butter chocolate fan. I also happen to be the designated bringer of dessert in pretty much every circle I am in and I love it. We were invited to a friend’s birthday awhile back and when I asked him what kind of cake he wanted, his response was simple: “Something with Reese’s.” That was a plan I could get behind. I threw around the idea of a Reese’s cheesecake but had wanted to make peanut butter buttercream for awhile and knew it would go great with my favorite chocolate cake recipe. To incorporate the actual peanut butter cups, I debated just chopping them into the frosting but wanted to do something different. To really put these over the top and make them more celebratory, I topped each with a full sized Reese’s peanut butter cup. As I suspected, these were a hit. You get the moist, chocolaty cake with the super thick, salty-sweet buttercream and the crunch of the peanut butter cup in each mouthful. Now I want them again. Anybody have a birthday coming up? Mix the dry ingredients in the bowl of your stand mixer. Add the wet ingredients except the water and beat on medium speed for 2 minutes. Add the boiling water and stir. The batter will look pretty thin; this is normal. Cream peanut butter and butter together with electric mixer. Mix icing sugar in on low speed until blended, then add vanilla and milk. Beat until incorporated. Add more milk or icing sugar if needed depending on desired consistency. This frosting is VERY thick and if you are wanting to pipe, as I did, you will probably need more milk. 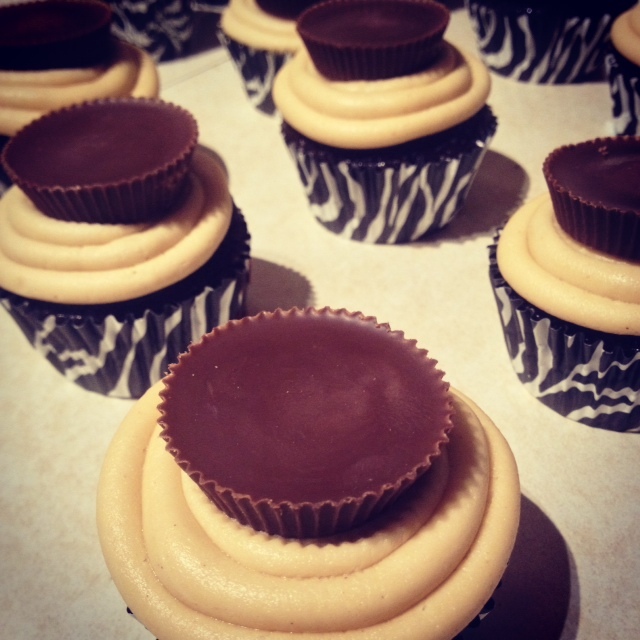 Frost cupcakes with buttercream and press one Reese’s Peanut Butter Cup on top of each. These look delicious! I love Reese’s!! Thanks! Can’t go wrong with that combo!